The famous gems of Montana, the Big Sky Country, are the Yogo Sapphires. They are extremely beautiful and are sapphires of excellent quality. My Yogo is named after these gorgeous stones. He is now the father of several Shih Tzu puppies. He is out of the girl who holds my heart, Teka, and is a handsome boy, very sweet, cuddly like a teddy bear to hold. He has a beautiful face, lovely wide bite, and great movement, a dog of excellent quality. I laugh at him because as a puppy I called him the boy with the big “booty”. He has a lovely wide rear-end and a lot of movement behind, smooth, level and flowing. His coat is amazing in quality…thick, tangle-free and with lovely texture. He is a dream-come-true for me and I am so delighted to have him in my house. 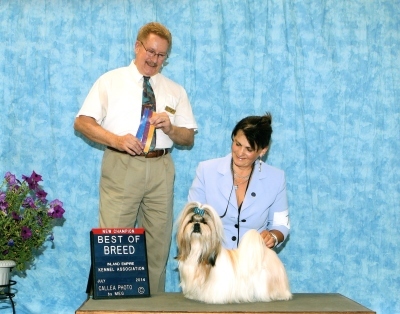 His first time in the ring at 7 mos he took a 3 point major, went Best-of-Breed the next day, and has won BOB several more times. He makes his own rules, and there is no sleeping in a pen for him; he has the run of the dog room…spoiled noooo, well maybe a little, but he’s worth it! Remington came to live with us when he was 4 months old. At the age of 6 months, I needed a dog to perfom a difficult training test within the next 2 months, consisting of a 10 part behavior chain including several different types of cues, verbal, physical, object, etc. After only 2 months of training, Remi performed his test flawlessly the 1st time he was tested. I was so proud of him. He is a charachter and loves to play “training”. He was a creative puppy, climbing the bookcase, but he couldn’t get back down, pulling chairs out to get on them, etc. He kept me busy and laughing. 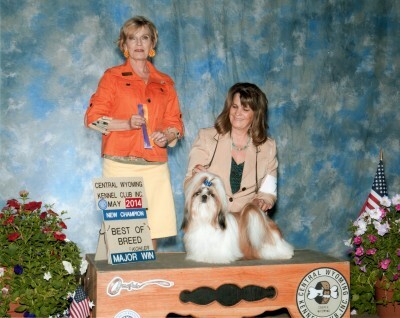 He is now a conformation champion, a father to more Shih Tzu puppies and now is up to new games and tricks. 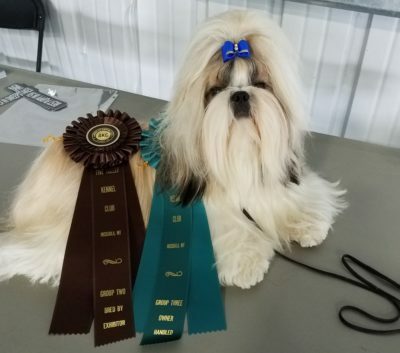 Rocky is a very sweet affectionate boy out of Ch Sapphire’s Laced With Diamonds and sired by Am/Can Ch My Dreams Foreign Affair from Alberta, Canada. He is a very mellow, laid-back boy. He enjoyed helping teach basic Family Dog Manners classes and watching Puppy Start Right classes. Unfortunately, he and Smooch didn’t get along very well, so a decision had to be made. Rocky now lives in a new home in Kalispell with a lady who adores him and 2 cats, who he thinks are awesome. 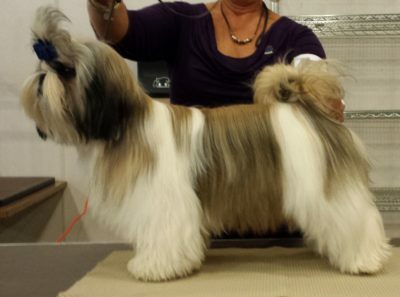 He will still be used for breeding at Sapphire Shih Tzu. Smooch, born May1, 2016 is a lovely mover and a very busy boy. He learned to ride in a toy wagon at a few weeks of age and he loves it so much i had to buy him a bigger wagon as he grew, because he could barely get in his little one. He has no fear and I can’t keep him off the agility equipment when I’m not looking. He loves to run, chase the cat and anything else he can find to entertain himself with. His mom is “Brandy”, Sapphire’s Branding Iron Hot and his daddy is an American/Canadian Champion, Ch Indigo’s Golden Serenity of My Dream Shih Tzu in Alberta, Canada, owned by Pam Jodoin. Smooch’s 1st day in the ring.